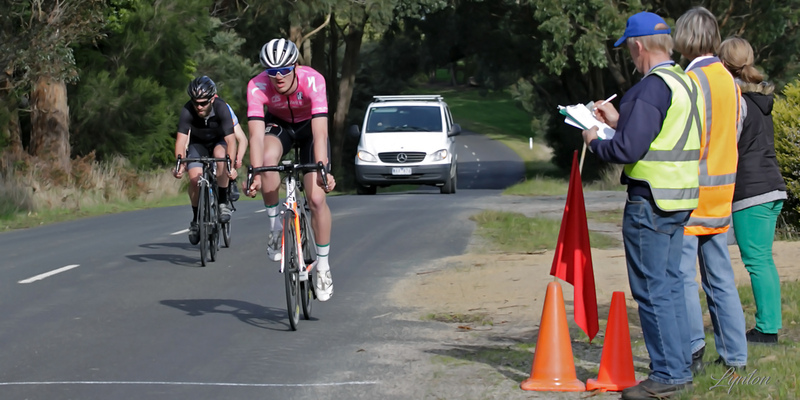 Leongatha North-Trida 8th Sept 2018 – Leongatha Cycling Club Inc.
Saturday the club held a combine meeting with the riders starting at the Leongatha North tennis courts and racing out to Trida tennis courts and back over a distance of around 46km. It was a great spring day with sunshine and only a light cold wind. This was fortunate for the riders as the race involved substantial climbing up to the ridge line at Trida before the lumpy trip across to Trida. To finish the race the riders also faced a steep climb back to Leongatha North. The riders raced were split into 3 graded scratch races. The A grade group had new club member Alex Dunbar easily handling the conditions such that by the turn he only had Will Lumby and Daniel Furmston (Latrobe Valley) for company. The remainder were left chasing and losing more time. Alex attacked the climb back to Leongatha North, however, Will Lumby was up for the challenge and sprinted to the line for first. Alex claimed he third 2nd place finish in 3 starts whilst Daniel Furmston rounded out the podium. The winning time was 1hr 22min 19 secs. Connor Bagot (Warragul) took 4th ahead of Chris Joustra (Latrobe Valley) and Leigh Stott chased home in 5th. In the B grade race, Thomas Fitzgerald and Mike Renehan (Wellington) did the damage on the outward ride with Allen Timmer-Arends (Latrobe Valley) turning just 20 secs in arrears. However, the leading duo did not allow him to regain contact and crested the hill at Leongatha North with a handy break. Thomas won the sprint to the line from Mike, Kevin Feely filled the 3rd place and Allen Timmer-Arends and Lachie Matthews were further adrift. The C grade field also split up on the climbs to the turn with a trio still together – Mark Bensley, Rod Cheyne and Peter McLean. This trio stayed together on the descents but the climb up to the finish saw Mark lose a little ground leaving Peter and Rod to contest the sprint. In the end, it was a clear win to Peter from Rod with Mark rolling in shortly after for 3rd place. Next in was Bernadette Fitzgerald and Robin Baker (St Kilda) rounding out the field.